As surely many people know by now, in early 2009 US pilot Captain Chesley Sullenberger successfully landed a US Airways plane onto the Hudson River in New York after a bird strike takes out both engines during take-off, saving all 155 people on board. It was an event that prompted many to declare Sullenberger a national hero, even though the man himself humbly admits to just doing his job. With that in mind, there is a fascinating movie to be made about his world-famous incident and its impact on his personal life. However, Clint Eastwood’s Sully isn’t that film. Although it is not a complete failure, with solid acting and some suspenseful cinematography, neither Eastwood nor screenwriter Todd Komarnicki succeed in finding the right balance to portray the incident as not only a story worth telling on the big screen, but also one worth caring about – which ends up being a rather large detriment to the real-life act of heroism. Instead, the film they have crafted takes a non-linear approach, cutting back and forth constantly to the moments leading up to the crash, and then back to when Sullenberger (Tom Hanks) and co-pilot Jeffrey Skiles (Aaron Eckhart) are being investigated by the National Transportation Safety Board for their actions during those crucial seconds. This means a lot of sitting around in boardroom meetings and watching computer simulations in their entirety, all while offering no further insight into the personal development of Sullenberger – nicknamed “Sully” – beyond just being a normal pilot who occasionally gets horrific visions of his incident going horribly wrong. The sad thing is that Sully himself is written to be a not very interesting character, which isn’t meant to knock the real-life Sully as it should be assumed that how he is in this film is similar if not completely identical to his actual persona, but in a film that is meant to entertain the audience and get them to sympathise with the central figure, it’s just not compelling. Hanks is good in the role, even dying his hair and moustache white to further resemble Sullenberger, but let’s be honest: this is the kind of role that he could play in his sleep by this point, but he just happens to do it better than your average veteran actor. Even so, Hanks is limited by the drama-free script and even Eastwood’s scattershot direction to bring much to the dramatic interpretation, and all he can do is just stand there delivering lines and emoting while doing them, without giving the audience much reason to show us why we should really care about this guy’s story. You get the feeling that Eastwood had nothing but good intentions when he decided to bring this story to the screen, but Komarnicki’s script just doesn’t seem to go anywhere in terms of a linear story, forcing Eastwood to shift to and fro between different parts of the story, via some random editing that makes it all feel even more disjointed. This is also Eastwood’s first film since arguably the biggest hit of his directorial career, American Sniper – another film about a US hero battling certain demons to eventually come out on top – and say what you will about that movie, but it did at least have a better grasp on storytelling, characterisation, and even suspense. These are all things that Sully ultimately lacks, as it struggles to cobble together a coherent and focused story from something that’s not a very theatrical tale at all, barely gives us a real reason to care about the characters in this film, and the suspense is non-existent as not only do we all know the outcome of the event, but we also know that nothing bad ever came from the investigations following it, thereby making what ends up being a pretty large focus of the movie completely uneventful. On the plus side, at least it is competently made; Eastwood does shoot his scenes with pride, even when nothing much is happening, and has regular cinematographer Tom Stern make it look more intense than it actually is (a large chunk of the film was shot in IMAX, so for that sense of scale I’d say it’s worth checking out in that format). However, no amount of competence can ultimately make the story of Sully less ill-suited for the big screen, at least not in this interpretation of the story. 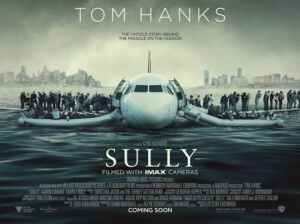 Sully has good intentions as well as a decent lead performance by Tom Hanks, but ultimately fails to narrow down the dramatic elements to make the real-life event it was based on compelling theatrical entertainment.